After losing Mom and Dad, we had to clear out their home. 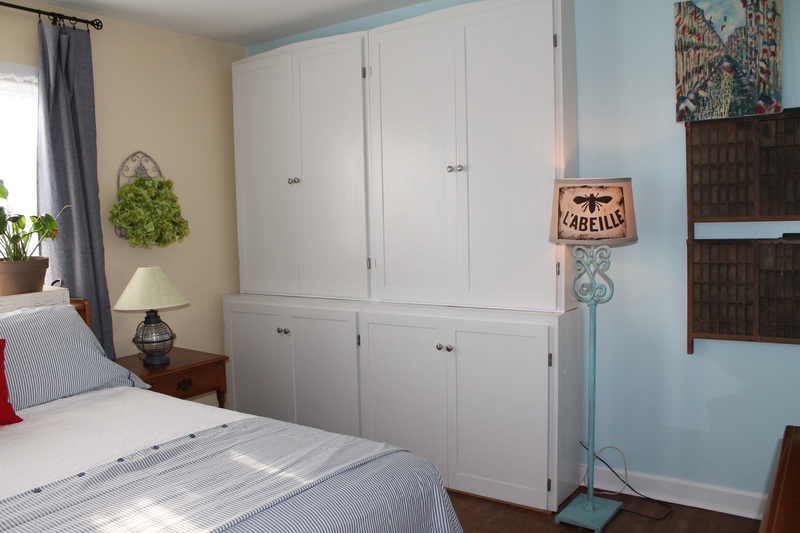 I took the bedroom furniture that was in my childhood bedroom and made a guest room. Our kids visit frequently enough to benefit from a bed instead of the air mattress we had been using, so it made sense to bring the furniture home with me. 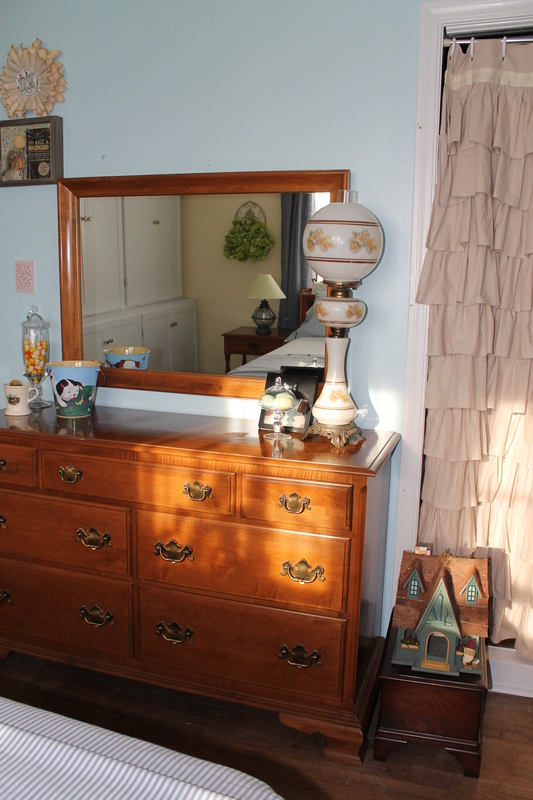 This room was my first craft room before I moved to the other bedroom, and we didn’t have time to paint it before we moved the furniture in. Next summer, we will repaint it and repair the walls, so don’t judge! Some of the pictures are hung to cover previous hangers, so they aren’t the best placement, but they will end up being moved after we repaint. The other side of the room houses this gigantic movie cabinet, which is pretty much full already.I had the bottom piece that was open shelving but solid wood. Chris added doors and then made the upper pieces to match. 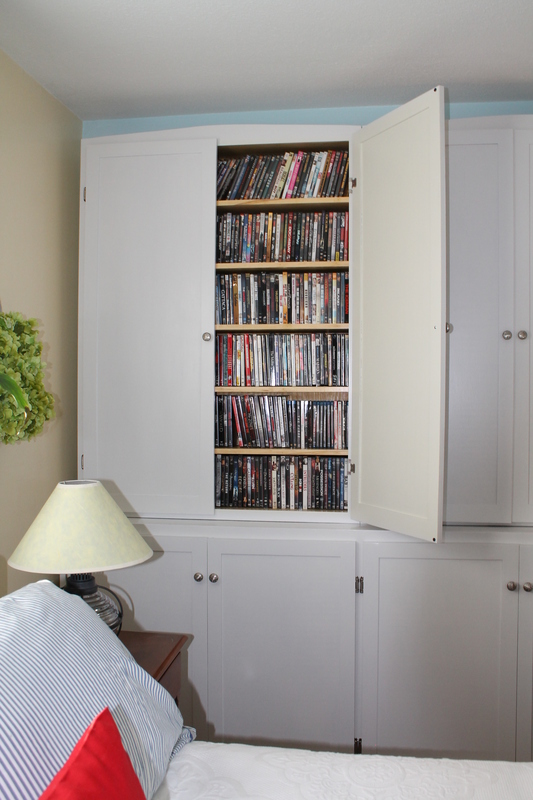 It has a bit of a ledge to set movies on, and the inside has shelves that are the perfect size for DVD’s. We keep movies in the top and television shows in the bottom. All of our blue-ray are stored in a different cabinet, and we are buying more and more movies on the cloud. We have an extensive collection. I sewed the curtain on the closet for my upstairs shower curtain, but when I redid the bathroom a few weeks ago, I moved this curtain downstairs, and it fits nicely. When we repaint, I’ll hang an appropriate curtain rod, but for now, this works fine. I love this chair. I hunted everywhere for one, and Wal-Mart had this one. It’s small, probably child size, but it’s a nice little rocker for me. I got the picnic basket at World Market a few years ago and had no idea what to do with it. Now it has a perfect place to sit. 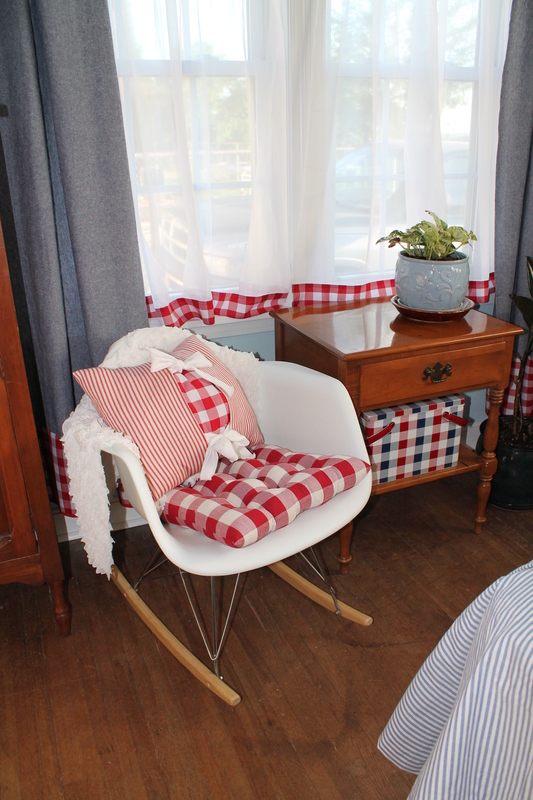 I sewed the curtains from chambray and added the buffalo check border. I left them short to expose the baseboards. In an old home like ours, I’ve learned to take advantage of the architectural features and not cover everything. I also added the borer on the sheers for a fun touch. The plant on the floor is a rubber tree that the college sent when Mom died. I had it in my office and decided it needed more natural light before I killed it, so we repotted it and brought it into this room. It is recovering nicely. I do not have a green thumb at all, and I really want this little tree to live, so I’m trying to take good care of it. 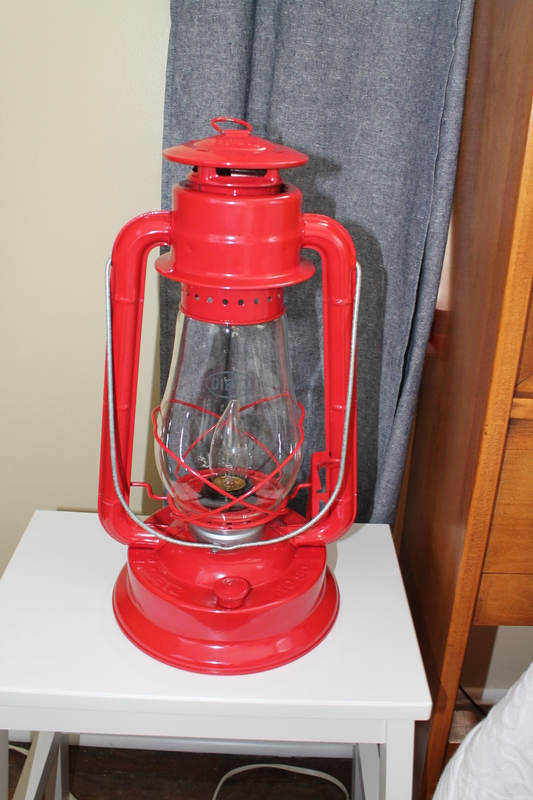 I wanted to find lamps that were just right for the room, and I found this little red lantern. It lights up and is perfect for bedside reading. It sits on an Ikea stool that I use on occasion. It takes up less room than the side table takes up, so it fits perfectly in this corner. I found this lamp online and purchased it because it is not overpowering and brings a nice blue glass into the room. 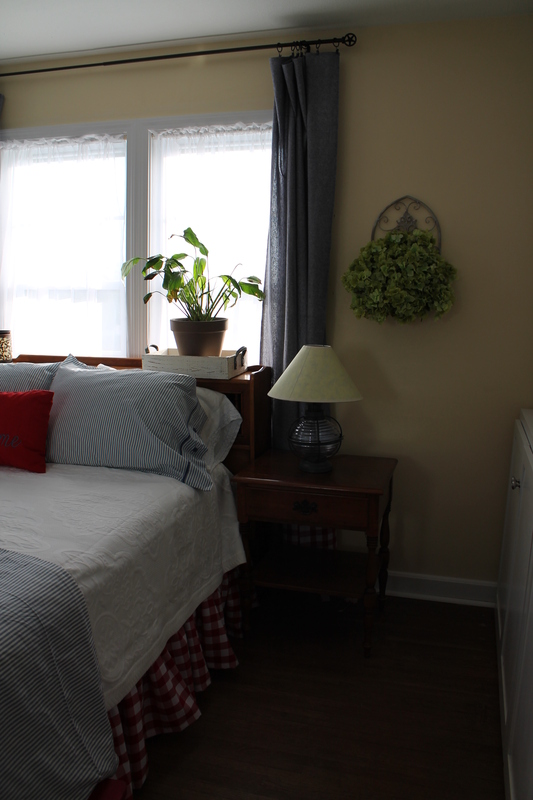 The plant on the bed frame is one that the president of a neighboring community college (and my alma mater) sent when Dad died. I’m struggling with regulating the water it needs, but it’s been alive for nine months, and that is a miracle for me! I already had the basket on the wall for craft storage, so I put some silk hydrangeas in for color. This corner is one of my favorite spaces in our whole house. The window was original to the house, and I saved it when we installed new windows. 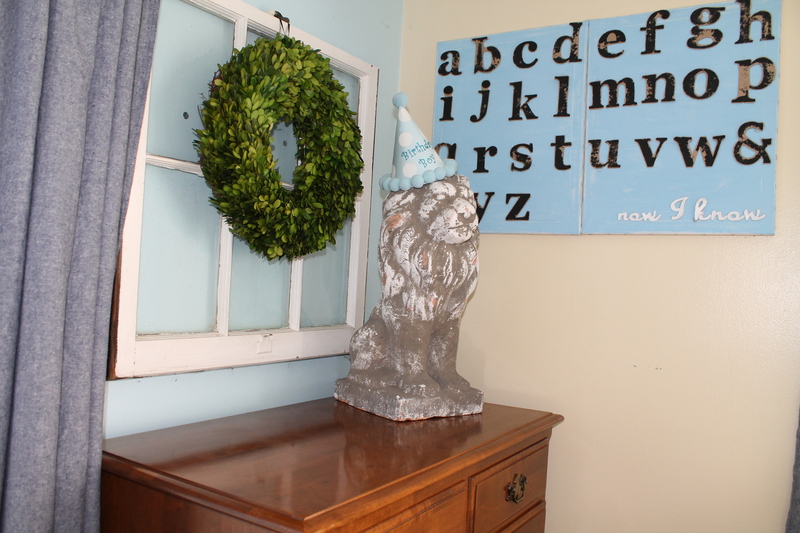 I found the little concrete lion at a local flea, and his birthday hat is one that our daughter gave to our son for his 20th birthday. He let me keep it, and it is a cute accessory for the lion. I made the sampler, and the bottom says ” . . . now I know.” Learning to read was the most important skill in my life, and I remember learning the alphabet in first grade and telling Mrs. Strickland that I was done with school. “I came to learn everything,” I told her, “and now I know.” That story passed around my little elementary school for years! 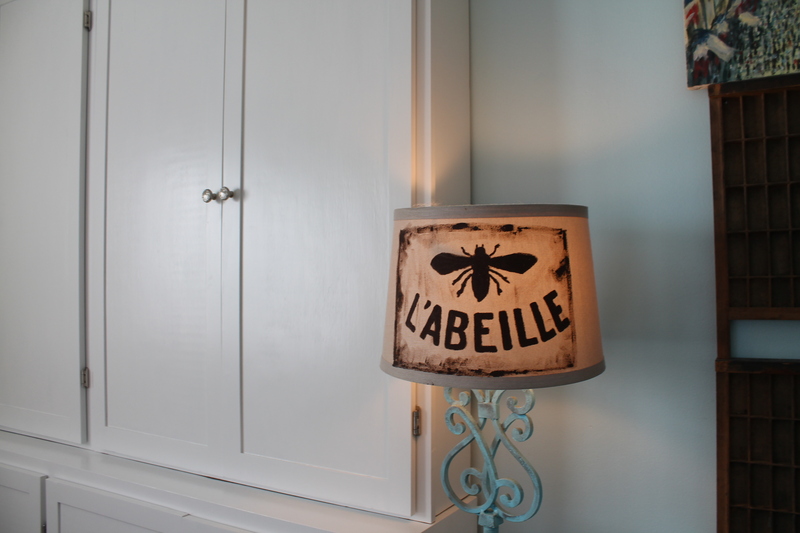 I saw a painted lampshade like this on Pinterest and made one for myself. I held typing paper up to my computer screen and traced the pattern, then taped it inside the lamp, turned the lamp on, and traced it on the outside of the shade and painted it. The woman who posted it gave a great tutorial, but I didn’t have a printer that worked at the time, so I improvised. 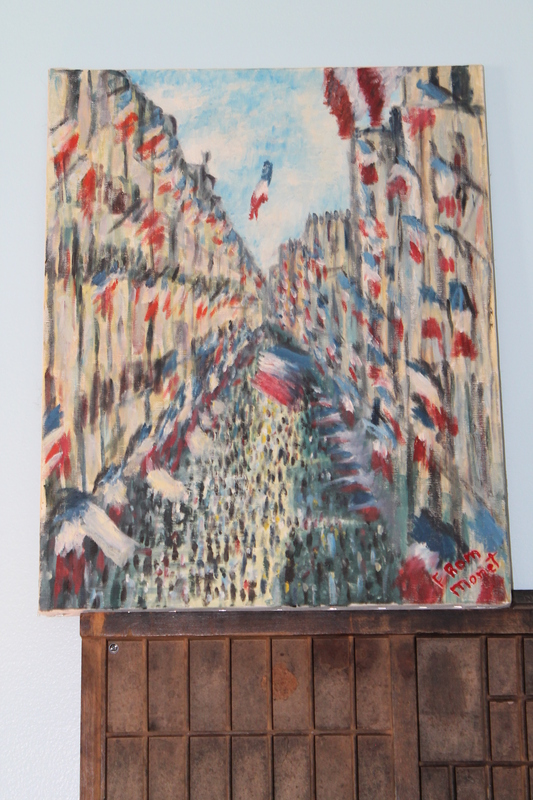 This is a painting my husband painted in a college art class based on a Monet painting. I absolutely love it, and when the room is painted, this painting will have a prominent place in the room. Right now it sits on an antique printer tray from the newspaper in Canadian, Texas. My dad was raised in a nearby town until he was ten or so, and Canadian was the place where everyone “went to town.” It is also the location of the farm where Tom Hanks finally delivers the Fed Ex package in Castaway. 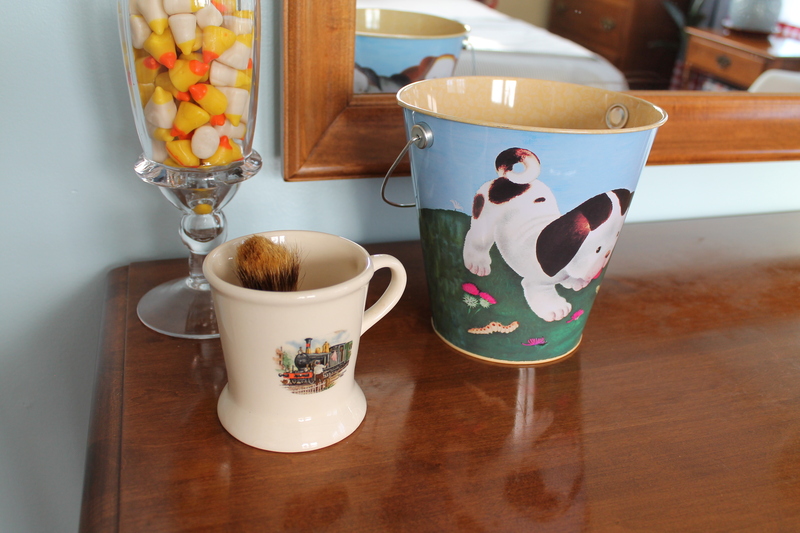 This was my dad’s shaving cup when he was a teenager, and I keep small toiletries in the pail for guests in case they forget something. The yellow marshmallow ducks are a tribute to my daughter. Once when she was about five, we went to the mall and bought a bag of Easter candy corn. While she was sleeping, I stayed up all night talking to my dear neighbor, Lyndall, about a difficult decision I needed to make. We ate all of Lauren’s candy corn, and she has never let me forget that! 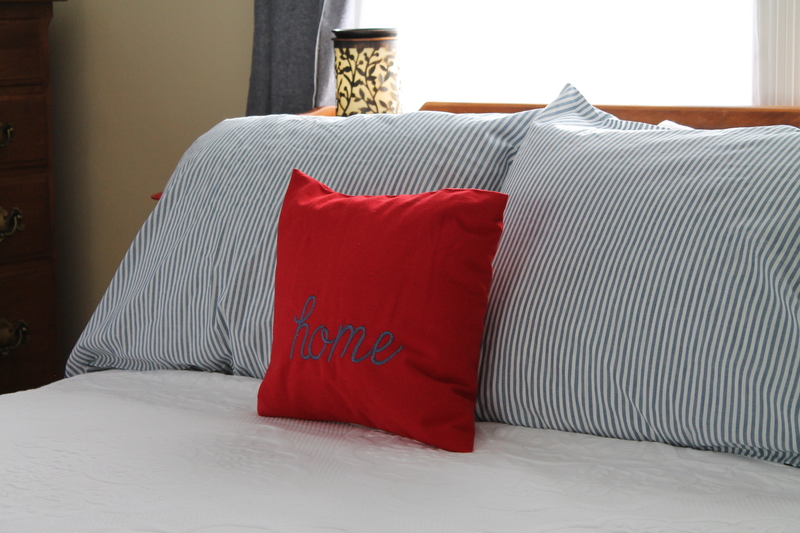 I embroidered this pillow to say, “home.” It’s always been important to me for our kids to feel like this was their home and will always be a welcoming place to return. I saw this on a Pinterest post and knew it was what I wanted. I want to add a couple of red pillows made from mattress ticking, but I haven’t figured out what I want them to look like yet. I love this room. 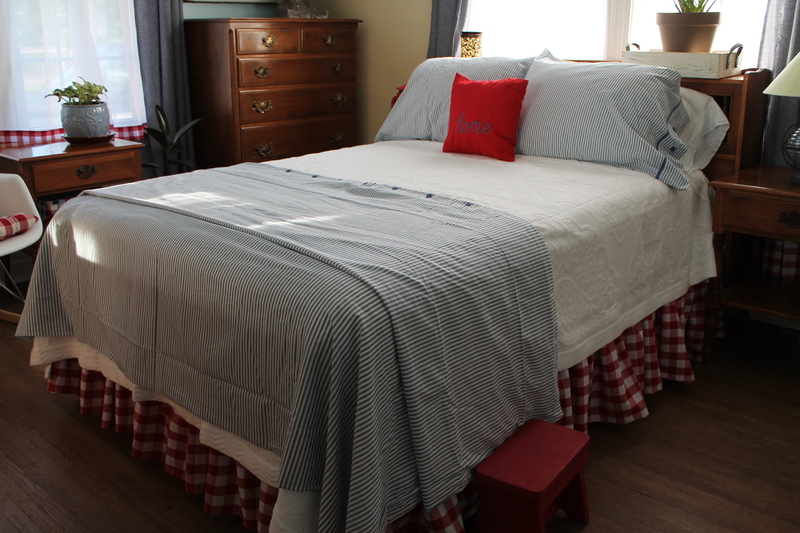 I sewed the bed skirt and built everything around it. 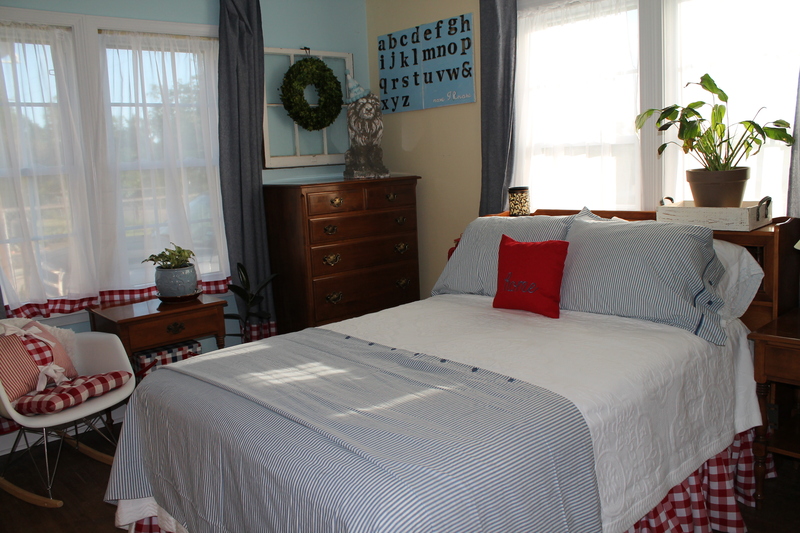 I found the perfect bedding and then added the chambray curtains. It makes me happy because it reminds me so much of Mom and what she loved in her own home. I know she would be happy here, and I know she is looking down and loving that I am taking care of her Ethan Allen furniture and honoring her life in the best possible way.